I can explain why those dark chocolate squares brightened my coworker’s mood. Studies show chocolate boosts serotonin (your happy hormone) and triggers a rush of feel-good endorphins very similar to that just-in-love feeling. Chocolate also contains anandamide, which your brain naturally produces and which activates the same target as marijuana. 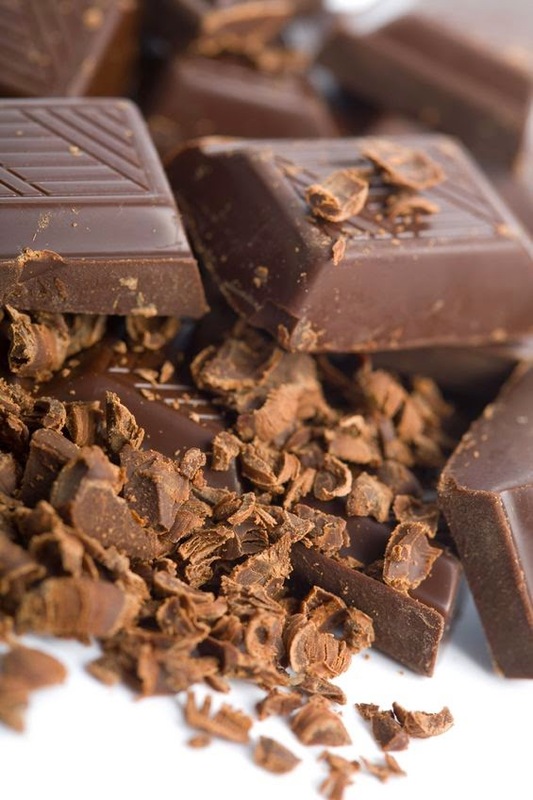 Not only that: two chocolate ingredients inhibit anandamide breakdown. You not only feel better; that feel-good boost sticks around even longer, which becomes a win-win in my book. Combined with its caffeine (a one-ounce chocolate square contains about 12 mg) and other nutrients, you can better understand why a few chocolate squares can brighten your day. Dark chocolate also contains magnesium, which I call the ahhh mineral. If I’m having a stressful day, taking 200 mg of magnesium citrate always puts me in better spirits. When clients tell me they crave chocolate, I almost always connect a magnesium deficiency. A one-ounce dark chocolate square contains about 10% of your Daily Value (DV) for magnesium. Nothing to write home about, but considering upwards of 80% of Americans has magnesium deficiencies… Well, every little bit helps. About 10 years ago, the British Medical Journal published an article about the ideal meal: Seven ingredients that, if you ate them every day, could reduce cardiovascular disease risk over 75 percent. What did that Polymeal (as they called it) constitute? Wine, fish, nuts, garlic, fruits, vegetables, and – my favorite – chocolate. Yes, chocolate. Far from just being an indulgence, chocolate carries a plethora of health benefits. For one, it contains more phenolic antioxidants than most foods. Studies show those antioxidants can help reduce your risk for insulin resistance and Type 2 diabetes. Epicatechin (yeah, the same stuff as in green tea) provides cocoa’s cardiovascular benefits. Cocoa can also reduce inflammation, protect your skin from UV damage, boost satiety, and improve cognitive function as well as mood. One study found Italians who regularly eat dark chocolate have lower amounts of the inflammatory marker C-reactive protein. I could go on, but then that would turn into those kind of chocolate-is-healthy articles I dismiss. Regardless, if you need more reasons to eat chocolate (and for the record, I don’t), well, there you go. Five bucks doesn’t buy much these days, but it can buy you a few pieces of damn good chocolate in the finest boutiques in Los Angeles or Paris or New York or pretty much any city. I had the, um, arduous job of taste-testing the world’s finest chocolates, and I’ve featured the crème de la crème on my chocolate page. I don’t get compensated for featuring them. I feature them simply because they sell the world’s best chocolate. Personally, I would rather spend five bucks on a few pieces of chocolate rather than a Starbucks coffee or a glass of wine, but everyone has their pleasure. Yes, you can eat chocolate every day, with a few major caveats. You must choose the right kind. “Dark” should preface chocolate. Now, manufacturers have become savvy that people favor dark chocolate because of its health benefits, so they use the adjective more often these days. Just because it says “dark” doesn’t automatically make it healthy. Read those labels and don’t be easily swayed. You want to look for dark chocolate at least 80% cacao, preferably organic, with no more than seven grams of sugar per serving. If you grew up eating Hershey’s, you might be in for an, um, bitter awakening with dark chocolate. You might not initially love it, but look at it this way: You’re refining your palate. Pretty soon, that drugstore milk chocolate junk will taste like junk. Trust me. Few chocolates will make that cut, but they’re worth seeking out. Whatever you do – and you know this – steer clear of most commercial stuff. You deserve the very best chocolate, so make it your mission to find your city’s best chocolatiers and frequent them often. Moderation really becomes key here. Break off one serving and pawn the rest or hide it in your freezer. Chocolate is not a more-is-better food, and too much can stall fat loss or even make you gain weight. If you need a pre-workout snack or just need to bust cravings, check out Cocomune bars, which I swear taste like a Mounds bar but without the added sugar. Loaded with fiber and immune-boosting colostrum, I keep them on me when I travel, or when I'm starving and stuck in rush-hour traffic. You probably grew up eating commercial chocolate. Did switching over to dark chocolate require some effort? I’m always interested in new chocolatiers, so please share your favorite below or on my Facebook fan page.